In our body, the Skeletal Body System is the innermost organ system of the body made up of a skeleton consisting of membranes, bones and cartilage. In our body, the �skeleton� grows quickly and adapts precisely to our movement patterns. If we place more strain on it through our work or sports, then it reacts and becomes stronger at these points. The �Skeletal System� supports the body, but in a flexible rather than rigid manner. Wherever two bones meet, there is generally a joint present which provides ease of movement between the two. The bones of the �Skeletal System� appear hard and dry, but they consist of living cells, blood vessels and nerves. In �Skeletal System�, each one of the more than 200 bones, however varied they may be in size and shape, is one line in a long chain. The �Skeletal System� is an ingenious structure of the bones, particularly the internal structure and the linkage between each other, that make our skeleton what it is: a purposeful, coordinated and functioning whole. In our body's skeletal body system, the Skeleton, our bony frame, is made up of over 206 different bones (126 appendicular, 74 axial, and 6 ossicles) that gives our body both it's stature and it's outward appearance. In our body's structural organ system, the subsystem Skeletal Body Organ System (Skeletal System), a flexible bone structure known as the skeleton, is our body's framework made up of over 206 different bones giving the body both it's stature and outward it's appearance, which protects our body's soft parts and internal organs, produces blood cells, and stores mineral salts. In our adult body's structural organ system, the Skeletal System may be grouped in two skeletal divisions; the axial skeleton (trunk) and the appendicular skeleton (limbs). In our body's skeletal system, the Skeleton, is made up mostly of bones connected by joints (articulations). In our body, the Bones function as an organ to move, support, and protect the various other organs of the body. In our body, the Bones produce red and white blood cells and store minerals. In our body's Back, the vertebrae are arranged in a long vertical column and held together by ligaments, which are attached to muscles by tendons. Between each vertebra lies a gel-like cushion called an intervertebral disc, consisting of semifluid matter (nucleus pulposus) that is surrounded by a capsule of elastic fibers (annulus fibrosus). In our body, the bones provide the structural framework for our body as a specialized connective tissue organ of the skeletal organ system, which protects internal organs and maintains mineral ion balance. 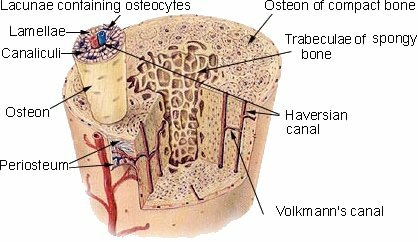 In our body, the bones are the rigid organs that form the main constituent our skeleton, with the principle cellular bone components comprised of osteoblasts, osteocytes, and osteoclasts. In our body, the Bones are made up of osseous tissues (bones), marrow, blood vessels, epithelium and nerves. In our body's mouth (oral cavity), Teeth are part of the Skeletal System not counted as bones. Each tooth may be described as a nonshedding hard surface, made of enamel and dentin that offers many different sites for bacteria colonization both below (subgingival) and above (supragingival) the gingival margin. In our body's mouth (oral cavity), Teeth are part of the Digestive System as an Accessory Organ along with the tongue, liver and pancreas. In our body's mouth (oral cavity), there are 32 Teeth in a complete permanent (secondary) set, grouped as the bicuspid teeth, cuspid teeth, incisor teeth and the molars (which include the wisdom teeth). The shape of each Tooth type corresponds to the way it handles food. In our body, a complete set of deciduous (primary) Teeth (Tooth) contains 20 Teeth.